Rocks of the San Hipolito Formation crop out on Punta San Hipolito and are the best exposed and most easily accessible exposures of marine Triassic rocks in Baja California. The author became interested in the San Hipolito Formation while preparing a geologic map of Punta San Hipolito and adjacent territory for Petroleos Mexicanos (PEMEX) in June of 1973. Further mapping and sampling were carried out in January and June, 1974 and June, 1975. A detailed petrographic study of thin sections made from the volcanic and sedimentary rocks on Punta San Hipolito was undertaken in order to gain a better understanding of the depositional and diagenetic history of the San Hipolito Formation. 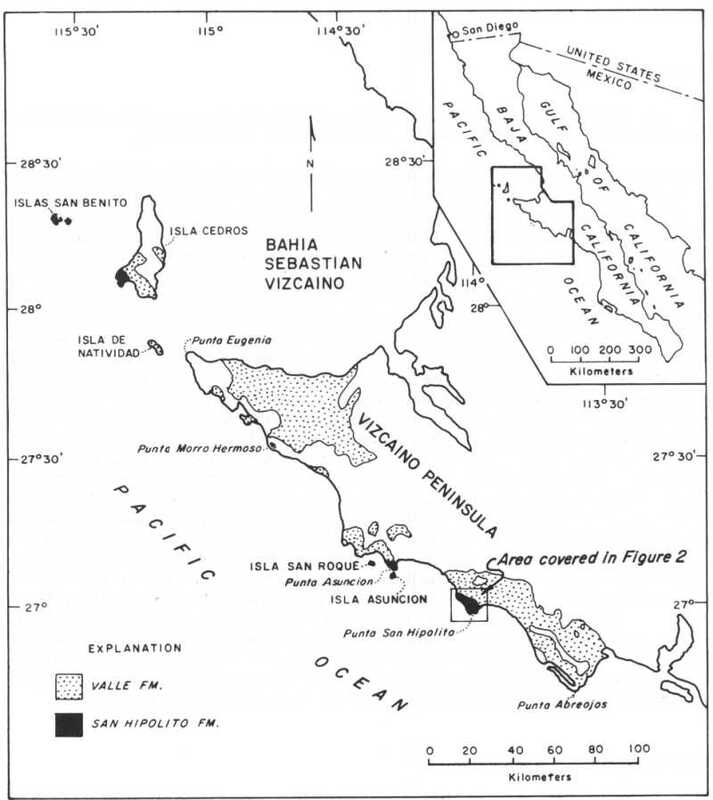 Punta San Hipolito is a rocky headland that juts into the Pacific Ocean from the barren Vizcaino Peninsula of Central Baja California (see Figure 1). It may be reached by way of Mexico Highway 1 and a rough, unmarked, but well-travelled dirt road (Gerhard and Gulick, 1962). The turnoff from Highway 1 is at Cafe Fisher, about 20 kilometers north of San Ignacio.Three villages are located on Punta San Hipolito. San Hipolito and Campo Viejo are seasonally occupied by ten to twenty families and Punta Prieta, the largest village, has a year-round population of seventy to one hundred. The inhabitants are associated with lobster and abalone fishing and related enterprises. The dominant physiographic feature on Punta San Hipolito is a low set of northwest-trending hills that is moderately dissected by dry arroyos. The rocky beaches are backed by cliffs ranging from a few meters to several meters above mean sea level. Vegetation is very sparse, most of it consisting of low bushes and a few varieties of cactus, including ocotillo and torote. The climate is mild and very dry. Annual rainfall totals are small, but the runoff from a single storm is usually sufficient to render roads in the region impassable for several days. Almost constant winds blow off the ocean from the northwest during the summer months and keep the area pleasantly cool. Due to the low rainfall and the paucity of groundwater, most of the region is sparsely settled and undeveloped.